Unknown vintage; drank 4/11/16 @ the Yarchives. A rough pour yielded a small dark tan head; almost no lace. Blackberry, candle wax, cognac & faint bubblegum notes in the nose. Black coffee, plum & faint bubblegum flavors up front; fresh earth & bakers chocolate notes on the finish. A hearty, complex, rewarding RIS. This was welcome on a cold April night. Pours almost black, with brief 1/2" tan head, that leaves a ring, and a few very small islands of foam. Cola-brown when held up to the light. Smells of roasted malt , cola, coffee, unsweetened chocolate, and slight nuttiness. Taste is dark chocolate, black coffee, brown bread(slightly sweet, roasty malt) , and a dusting of hazelnut. Some light lingering bitterness. On the first two or three sips, I got a slight vegetal flavor with the lingering bitterness, reminiscent of sautéed sage (not unpleasant) but it disappeared after that. Feel is smooth , lightly oily, with very fine underlying carbonation, that produces some tingle on the finish. Overall, quite good. Slight ear-warming at first, otherwise no indication of alcohol. Dangerously smooth & easy-drinking. Pitch black colour with an awesome blooming head of milk chocolate coloured foam that leaves nice lacing. A full nose (very full) with roasted malt, black coffee, dark chocolate and hops. These flavours return in the taste, where the pilsener hops add a nice accent to the massive stout flavours. Mouth feel is full, smooth and oily. Lovely RIS, too bad the high abv prevents me from grabbing another. Virtually no head, but what head there is actually produces lacing! Dark brown, almost black body. Nose of bitter chocolate, unsweetened chocolate, dark malt, and slight roasted malt. Taste mirrors nose with a hint of milk chocolate flavor coming forward. Good feel and overall, a tasty nightcap and would have again. Cheers! Pours pitch black with hardly any head. Smell is dark chocolate, zero smell of the barrel. Taste at first was a bit bitter/sour, as it warmed up it became less and less. The scotch pulls through strongly. Feel is warm and cozy. Overall not a bad stout. Bottle #75 (2008) from Jeremy. INky black pour with a small beige head. Aroma is dark chocolate and roast grains. Taste is dark, semi-sweet chocolate, brown sugar. Sweet and smooth. Really nice. '09 vintage. This has held up exceptionally well, even with the expected thin body and lack of carb. Taste like a chocolate-covered coffee bean that's often served with espresso! black color with small dark beige head. retention isn't strong as I expected. it smells burnt malt, bitter chocolate and slightly wood. taste is very similar to smell, but there are also licorice and coffee. full bodied, low viscosity and carbonation. high abv is not hidden. it's really complex stout, but it would be more delicious if it has 8 or 9 abv. Honestly thought this was a sour for the longest time because it is right by that section in my local bottle shop, however upon reading the label and inferring from the ingredients that this was a darker beer I grabbed it. Poured from 12oz bottle into Spiegelau Stout glass. 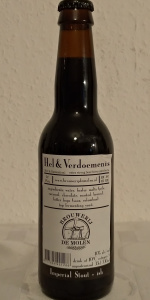 Bottled on the 27th of November 2014. L: Completely black with ruby edges when held against the light, half finger tan head forms but then dissipates into a thick ring after a minute or so. S: Smells of cocoa, sherry, wood smoke, dark chocolate. T: Yeah a lot of cocoa with the sherry falling off here lending more to the wood smoke and dark chocolate with some faint coffee. Leafy hop. F: Medium-Full body, average carbonation, semi-dry coffee like finish. O: A pretty solid RIS and a good beer.